The former Middlesbrough, Celtic and Dundee United midfielder will sign after leaving Sheffield United. Aberdeen have confirmed that Barry Robson will return to the Scottish Premier League for the 2013/14 season on a one-year contract. The Inverurie-born midfielder, capped 17 times for his country, was at Sheffield United last campaign after spending a year in the MLS with Vancouver Whitecaps. Dons boss Derek McInnes told the club's official website of the news: "Barry is a player I know well and having been a teammate of his I can see the same hunger and determination within him as he had when I played alongside him. "It's clear to see he has retained a high level of performance." Barry Robson started his career with Inverness Caledonian Thistle, before moving to Tannadice in 2003. 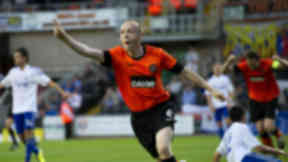 During a five-year spell at Dundee United he became known for his goalscoring feats, averaging one in every five matches. From there he joined Celtic, where he won the 2007/08 SPL title and scored a memorable goal in the Champions League against Barcelona. From Celtic he moved on to Middlesbrough, where he enjoyed three productive seasons, before moving on to the MLS. Robson added: "I know how big a club this is, I know how good a club it is and it's always a club I wanted to play for and I am just glad I am getting the opportunity to do that." The midfielder will again link up with Derek McInnes, who featured alongside him in the Dundee United side between 2003 and 2006. By coincidence, the 34-year-old will also be reunited with the newly recruited Willo Flood, who was his team-mate at Dundee United, Celtic and Middlesbrough.